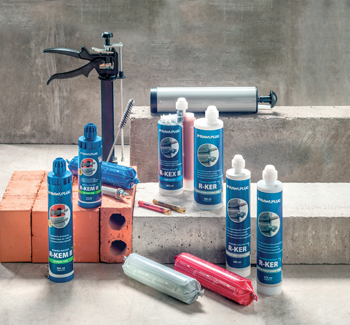 Rawlplug’s range of fixing solutions. Rawlplug Middle East, a UAE-based specialist in a wide range of fixing solutions, is looking at further strengthening its presence in Saudi Arabia, where it has already secured some of the most prestigious projects under way. “We intend to solidify our relationship with our distributor by providing state-of-the-art products and the latest innovations in the fixing world, backed by solid technical support and ready stock in Saudi Arabia and in our regional hub in Jebel Ali, Dubai,” says a spokesperson for Rawlplug. The company had earlier announced plans to expand its warehousing facility in Jebel Ali Free Zone with the latest warehousing technology to streamline its logistic support to its regional markets. Rawlplug has been present in Saudi Arabia since 1965. The spokesman elaborates: “We had a presence in the Saudi market through different distributors at the time; now we are cooperating with a professional and focused distributor Solver (Dar Al Afkar), which is based in Jeddah. The distributor is going through the whole technical approval cycle to get the name Rawlplug on the approved manufacturers list for all major projects in the kingdom, which is securing us a fair share in this important market,” he said. The company’s products have been supplied to a number of prestigious projects including the Kingdom Tower, Kudai Towers, King Abdullah International Airport (KAIA), Haramain High Speed Railway (HHR), Al Haram expansion project in Makkah, King Abdul Aziz Medical City, King Abdullah Financial District (KAFD) and the Riyadh Metro. The Middle East arm of the UK-based Rawlplug, which has been operating in the Gulf for more than 30 years through a network of distributors, has witnessed double-digit growth in sales and market share over the past few years. It set up its regional hub at Jebel Ali in 2006 to better serve its customers and reduce delivery time. The company’s product range, which comprises almost 30,000 line items corresponding to products and its variants, includes bonded anchors, which are offered in a wide range of systems like glass capsules, cartridges and foils, and mechanical anchors, which are metal anchors. Commonly referred to as chemical anchors or resin anchors, bonded anchors can be split into two main groups – capsule and injections systems, both of which consist of two chambers, one filled with a polymer resin and the other with a hardener. Various resin types are available in each system from polyester to vinyl ester and epoxy, he states. Mechanical anchors, used for high-load and technical applications, are offered as through-bolts, shield anchors and heavy-duty expansion anchors. The company’s R&D (research and development) department is continuously coming up with new fixing solutions as well as developing existing products with special consideration to the environment. It is currently developing products with a focus on insulation and façade fixings.